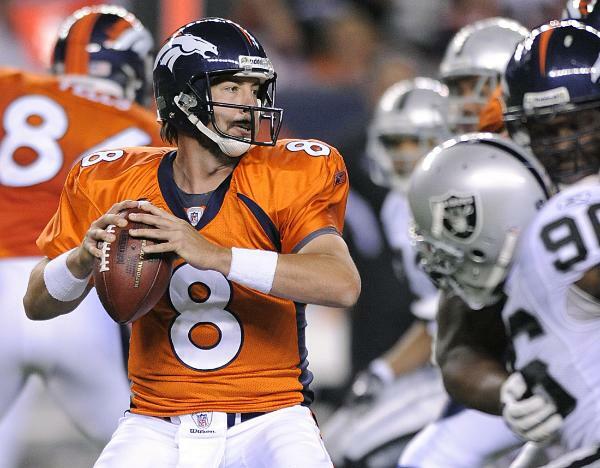 Denver Broncos quarterback Kyle Orton faced an unforeseen opponent during the NFL season opener last night, Sept. 12. While he certainly expected a tough fight against division rival Oakland Raiders, Orton's biggest challengeÂ came from his own team's fans. At the beginning of training camp, new Broncos head coach John Fox had attempted to quiet a growing quarterback controversy by naming Orton as the team's starting quarterback, despite the popularity of second-year passer Tim Tebow. However, when the Broncos struggled on Monday night, it wasn't long before fans started calling for back-up Tebow. Denver Broncos quarterback Kyle Orton faced an unforeseen opponent during the NFL season opener last night, Sept. 12. While he certainly expected a tough fight against division rival Oakland Raiders, Orton's biggest challenge came from his own team's fans. Entering the fourth quarter, the Broncos put together a successful drive that could have brought them within a field goal of the Raiders. However, in a pivotal play inside the red zone, Orton was sacked and fumbled the ball, leading to a Raiders touchdown. After the play, chants of "Tebow! Tebow!" started pouring from the stands. At that point, Orton faced his toughest challenge of the game. And he answered the call, leading the Broncos on a 12-play, 80-yard touchdown drive down that brought the game back within reach. Although Denver eventually lost to the Raiders 23-20, Orton demonstrated the mental toughness required of a true competitor. When facing the test of performing well in a season opener under the lights and against both a rival opponent and his own fans, Orton continued to lead his team until the final whistle.